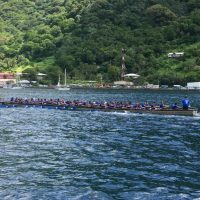 Three fautasi took on water and couldn’t race or continue the race: Aeto, Matasaua and Fono fautasi. I must say that this was one of the poorest fautasi race ever. The fautasi committee should have cancelled the race period for the safety of rowers and I thank God that no lives were were lost and if it was this flag day would have become a sad flag day and plus the start of the was not fair as all boats weren’t line up at the starting line. Maimau le malosi ma tigaina o nuu ma afioaga. 1. Safety inspections should be required of all Fautasi before each race. Safety standards should be set. 2. Life jackets should be mandated for all crew members and captain. 3. The Fautasi Committee should determine if all crew members should pass swimming requirements. LOGICAL SUGGESTIONS…SOMETHING TO SERIOUSLY THINK ABOUT!!! the announced results should be every boat is are winners leai gi second third and so on. What lead? And what fautasi race? Your headlline should read “Paepaeulupoo leads the pack in 2019 “fautasi race” inspite of Paepaeulupoo being four to five fautasi lengths in front of official starting line”. There fixed for you.